Studies have shown that as many as 4 out of 5 people develop some type of foot problems during their lifetime. We know that if you are viewing this profile you are concerned by your feet pain or discomfort, but now you can act fast and safe because our center is especially dedicated to treat your feet with the help of our state of the art medical equipment. We specialize in Laser Surgery and Minimally Invasive Surgery for bunions, hammertoes, heel spurs, ingrown and fungal toenails, neuromas, warts and other foot problems, procedures performed by our experienced doctors in their office! We are also pleased to offer non-invasive EPAT “Shock Wave” treatment for heel pain. We use computerized gait scan in order to fabricate custom orthotic (arch support) devices. It is elementary that any tissue that is not cut in surgery doesn’t have to heal. Further, it is interesting to note that bones themselves have little or no nerve supply. It means that your foot surgeon makes a small skin incision (less than 1/8 inch in length) rather than a large one and this way he can get straight into the bone to remodel and/or reposition it. Thus the discomfort is reduced consistently and chances are that you will be able to return to your normal activities (including walking) faster than by using traditional techniques. The most common problems that are corrected by minimally-invasive foot surgery are: Bunions, Tailor’s Bunions, Calluses, Hammer Toes, Soft Corns, Thick Toenails, Ingrown Toenails, Heel Pain, Morton’s Neuroma. Foot problems, such as ingrown and infected toenails, can be corrected without making any skin incision at all. Since minimally-invasive foot surgery can be performed in the doctor’s office rather than a hospital or surgery center it is more convenient, less expensive and there are less chances for certain post-operative complications. Also in most cases there is no need for pins, wires, screws, or casts, usually required post-operatively. Furthermore scarring is greatly reduced and so is the post-operative pain, because surgical tissue dissection in this type of surgery is not made. EPAT treatment has a proven success rate that is equal and maybe greater than that of traditional treatment methods (including surgery) and without risks or lengthy recovery time. It is one of the most effective for treating chronic proximal plantar fasciitis. We perform EPAT treatments in our office at Laser Foot Surgery Institute LLC and this type of treatment requires a minimal amount of time. Usually it requires 3 to 4 treatment sessions at weekly intervals. The treatment is done in approximately 15 minutes for each foot, depending on the disorder to be treated. Both feet can be treated at the same time and patients are immediately full weight bearing. As there is no incision there is no risk of infection at the treatment site and no scar tissue formation. Usually no anesthesia is required. This procedure also allows you to walk immediately and return to your normal activities within 24-48 hours. Many patients report resuming strenuous activities after 4 weeks. Also costs resulting from lost work are reduced. It is a fast, safe, and effective procedure. The word Laser is an acronym which stands for: Light Amplification by Stimulated Emission of Radiation. It actually generates an intense beam of light. The surgical Laser beam cuts or vaporizes tissue almost instantaneously. It is so precise that the surrounding tissue is hardly affected. The beam sterilizes and seals blood vessels as it cuts, so there’s less bleeding, less post-operative pain, and less chance of post operative infection than with conventional surgical instruments. 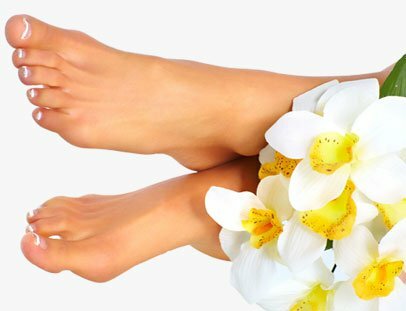 Some Common foot problems treatable with a LASER are Fungal Nails, Warts, Ingrown Toenails, Neuromas and Porokeratosis. In the past decade or so, a new science called Biomechanics has made a tremendous contribution to the various treatments that podiatrists could offer their patients. By applying these principles to the human foot, we are now able to treat many foot problems non-surgically by fabricating a pair of Custom Foot Orthotic Devices which are worn in the shoes and can be changed from shoe to shoe. The patient walks over a computerized gait pressure plate, making a 3-dimensional image of the foot in a dynamic rather than a static manner. This image is then sent via computer modem directly into the orthotic laboratory so that the accurate device fits perfectly. Some indications for Custom Foot Orthotic Devices which can be make for adults and children are Heel and Arch Pain, Flat Feet (fallen arches), High Arched Feet (raised arches),In-toeing (pidgeon-toeing), Out-toeing (duck-type walking), Pain on the Ball of The Foot, Some Callous Problems and Diabetic Ulcers and Pressure Sores. Our experienced doctors are coordinated by Dr. Richard M. Cowin, DPM, FACFAS, FAAFAS, noted podiatric surgeon, and the director of Laser Foot Surgery Institute LLC in Orlando, Florida. He is an acclaimed lecturer, practitioner, and pioneer in the field of minimally-invasive and Laser foot and ankle surgery. Dr Cowin has lectured extensively in the United States, Spain, Canada, Mexico, and China and some of the papers that he has authored have been translated into many languages and have been studied by doctors around the world.